She's expecting her first child in just a few months time, and Christine Lampard certainly hasn't let her style slip during pregnancy. The Loose Women anchor is currently juggling two jobs – her role on the aforementioned ITV show, and her current takeover as presenter of Lorraine – while Lorraine Kelly herself is off on her summer holidays. And Christine’s been debuting some brilliant looks for her TV stints – including a range of flattering dresses that suit her bump to a tee. But the outfit that most recently caught our eye was a stunning ruffled midi dress, which the expectant mum wore to present Loose Women last week. 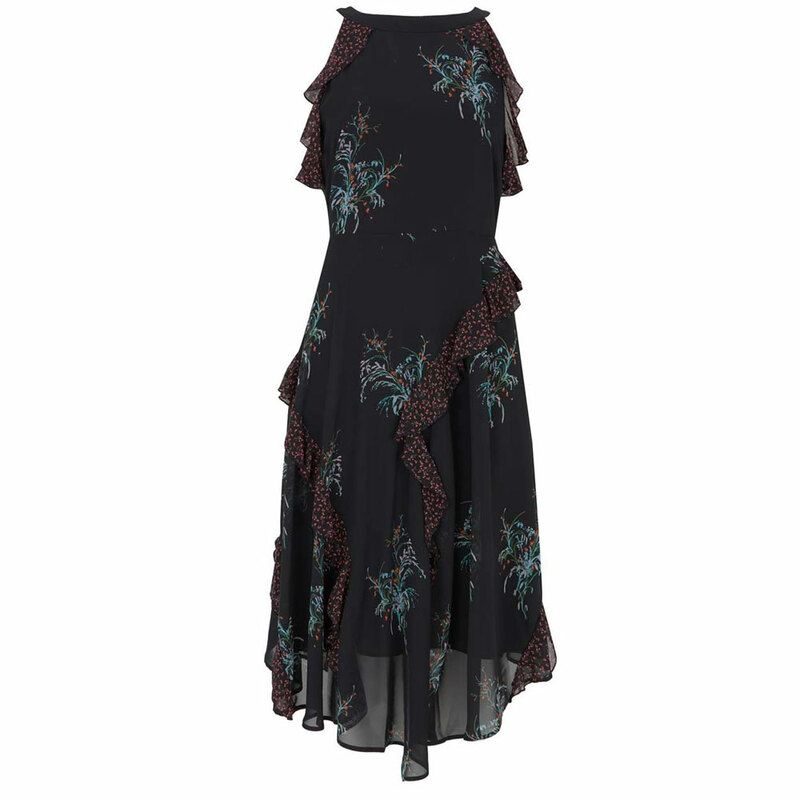 Christine opted for the Jane print ruffled midi dress, from one of our favourite stores, Mint Velvet. And the flowing, delicate fabric, with a stylish halter-neck, certainly made for a stunning summer look. The Lorraine presenter paired her dress with a simple pair of strappy black heels, and kept her long hair loose and curled. Christine decided on minimal jewellery to finish off the outfit, letting the intricate ruffles and flower design speak for itself. Isn’t it gorgeous? Her Mint Velvet dress is on sale for £119 – but it’s selling fast. The look is current sold out in sizes 6 to 12, but is still available in a 14, 16, and 18. So if you want one for yourself, you’ll need to be quick! Christine Lampard has been nailing a classic chic look for a while now, with the star regularly admitting that she much prefers simple dressing. Christine usually favours long and midi dresses such as this recent Mint Velvet one, to ensure a demure and sophisticated look. And we reckon it works pretty well for the TV star – don’t you?